This is a young adult, science fiction, dystopian novel that’s largely about DNA and “gene hacking.” It’s been on my radar for a little while, and I finally picked up a copy when the sequel was released late last year. I’m a little less than halfway finished right now and I feel… cautiously optimistic about this book. The last YA sci-fi series I read was Warcross and this definitely seems like it’ll be a set above that. This is a thriller which comes out tomorrow and I’m scrambling to get it finished so I can have a review up on the release date. I read I Am Watching You from the same author last year with my book club, and I liked it but didn’t love it. So far this is looking like a three star rating, but I’m hoping the later part of the book bumps it up to a four for me. It reminds me a lot of The Lying Game, by Ruth Ware (a group adult women returning to the boarding school where they grew up that harbors a dark secret from their past in danger of being exposed) but it’s definitely its own story. This is another ARC (April 2, 2019 release date) and I honestly can’t seem to get into it as much as I’d like. The feminist themes had me super intrigued when I read the blurb (it’s based on a true story and it’s about a group of Mennonite women who have been sexually victimized by the men in their community as they try to decide how to respond: do nothing, fight, or flee) but the writing feels rather… drab, honestly. It’s intentionally unpolished, as the narrator is meant to be a male member of the Mennonite community who they have asked for help because he can write, and he’s not highly educated, but I do think it takes away from the story. I wonder if this may have benefited from a third person omniscient narrator. I didn’t do a WWW Wednesday post last week, so I’ve finished a lot of books since the last one, so I won’t be discussing each title here as I normally would. I will say The Silent Patient was phenomenal. Full reviews should be coming soon on most of these titles (if you’re curious about a particular title, though, please feel free to ask about it in the comments and I’ll let you know some of my thoughts before I write my full review)! A sweeping historical novel about a dancehall girl and an orphan boy whose fates entangle over an old Chinese superstition about men who turn into tigers. When 11-year-old Ren’s master dies, he makes one last request of his Chinese houseboy: that Ren find his severed finger, lost years ago in an accident, and reunite it with his body. Ren has 49 days, or else his master’s soul will roam the earth, unable to rest in peace. Ji Lin always wanted to be a doctor, but as a girl in 1930s Malaysia, apprentice dressmaker is a more suitable occupation. Secretly, though, Ji Lin also moonlights as a dancehall girl to help pay off her beloved mother’s Mahjong debts. One night, Ji Lin’s dance partner leaves her with a gruesome souvenir: a severed finger. Convinced the finger is bad luck, Ji Lin enlists the help of her erstwhile stepbrother to return it to its rightful owner. As the 49 days tick down, and a prowling tiger wreaks havoc on the town, Ji Lin and Ren’s lives intertwine in ways they could never have imagined. Propulsive and lushly written, The Night Tiger explores colonialism and independence, ancient superstition and modern ambition, sibling rivalry and first love. Braided through with Chinese folklore and a tantalizing mystery, this novel is a page-turner of the highest order. What are you reading this week? Any thoughts on the books listed in this post? Please feel free to discuss or share WWW links in the comments! What did you think of Wildcard by Marie Lu? I read it a couple months ago and found it very enjoyable, and Marie Lu is one of my favourite authors. I unfortunately wasn’t a big fan. I may need to read some of her other work, though. I noticed that some of the negative reviews for Wildcard said they were disappointed because they were huge fans of her but this book in particular didn’t work for them. Oh, I’m sorry to hear you didn’t enjoy it. I have to agree that it wasn’t her best work, her other books are better, but I still enjoyed it. What’s your favorite book of hers? I have read the first two books from the Legend series, the whole TheYoung Elites trilogy, and the Warcross duology. My favourite I think would be either The Midnight Star (The Young Elites #3) or Prodigy (Legend #2). I’ll have to bookmark that. Thanks! No problem! I hope you enjoy those! I just watched Bird Box on Netflix. Have you seen it? I hardly ever watch something before reading the book, but I did with this and wasn’t as impressed as I thought I’d be. Now I’m curious if I should’ve just read it instead. I watched the movie before I read the book (not something I usually do either.) I really liked the book, but it is very similar to the movie, so if you weren’t into the movie you may not have the same experience with it that I did. Thanks! I’ll probably skip it then. I didn’t hate the movie, I just didn’t get into it the way I thought I would. 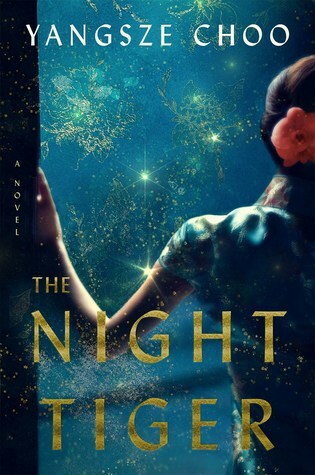 OMG I picked “The Night Tiger” for my BOTM last month and am planning on reading it this weekend! AND “The Silent Patient” – SO MANY BOOKS SO LITTLE TIME. finished my www Wednesday last night at 11:45pm 🙈 but I just finished “the kiss quotient” and #fashionvictim! Still processing the latter but “the kids quotient” was AMAZING.